The game's afoot! Come and listen to fourteen of the most famous Sherlock Holmes stories presented in full cast audio. 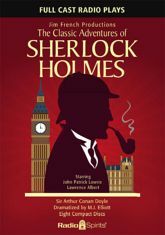 Based on the works of Sir Arthur Conan Doyle, and dramatized by noted British writer M.J. Elliott, these captivating cases star John Patrick Lowrie as Holmes and Lawrence Albert as Dr. Watson.